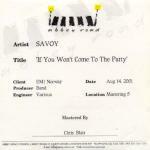 The first promo single "You Won't Come To The Party" from Savoy's album "Reasons To Stay Indoors" was released to Norwegian radio stations around 3rd September. The single probably won't be released commercially. The promo single includes the Radio Edit (3:59) and the Album Version (4:25) of "You Won't Come To The Party". The track was written by Waaktaar-Savoy, produced by Savoy and mixed by Sebastian Schmidt. The cover features a darkened shot of one end of a rounded corner sofa with a lamp standing on a table in the foreground. The title is printed in white letters at the top on the left hand side of the sleeve with the Savoy logo in red letters below. The reverse of the sleeve has a picture of what looks like an ariel view of the base of a lamp against a brown background. The tracks and credits are printed in white letters in the top left hand corner of the sleeve. The disc itself is black with the Savoy logo in red on the left hand side at the top plus the titles and other text in white on the right hand side. There exist only a few copies of the Abbey Road Master CD single of "If You Won't Come To The Party". It comes with a white insert with the abbey road zebra crossing logo at the top. 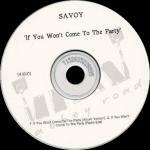 "Artist SAVOY" and "Title 'If You Won't Come To The Party'" are printed in black letters underneath. Also listed on the cover are "Client EMI Norway", "Producer Band", "Engineer Various", "Date Aug 14. 2001", "Location Mastering 5" and "Mastered By Chris Blair". The disc is white with the artist, title, date, track list and the abbey road logo printed on it in black / grey. There is also an EMI inhouse promo CD-R of "If You Won't Come To The Party" which comes in an album case with front and back text inserts. The front insert is black with artist and title plus the words "Hentet fra albumet "Reasons To Stay Indoors" (release 8/10)" (translated as "Taken from the album...") printed in white. The reverse of the front insert is plain black. The back insert is white with just the artist and title printed in black plus the outlines of two black boxes. The discs are just regular white CD-R's (TDK and Kodak versions exist), some of which have been written on by hand.